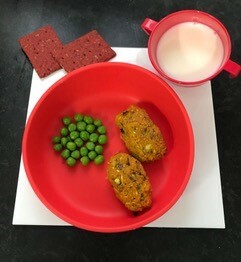 Sweet Potato Croquettes – Perfect for little fingers! 1 large sweet potato, grated. 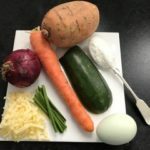 Place all of the vegetables into a bowl and mix them together, when they are well mixed put them into a sieve and squeeze out any excess water. Return the vegetables to a bowl and add all of the other ingredients. Form small sausage shapes with the mixture, pop on a lined baking sheet and bake for 25 minutes.